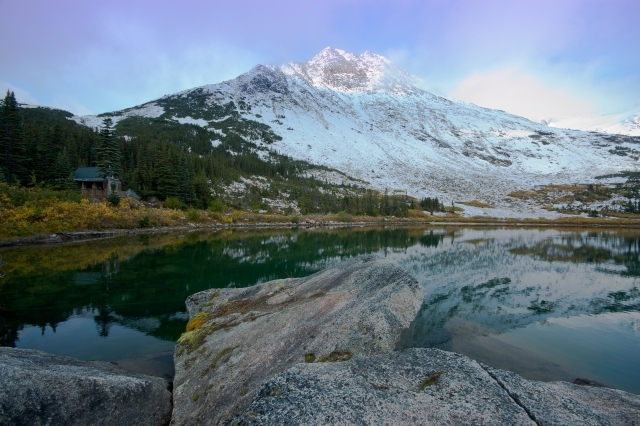 Nestled below a cirque of rocky peaks and a glacier, Upper Dewey Lake is a breathtaking place for a picnic or an overnight hike. There are two cabins, one is free, the other can be rented, and there are picnic tables by the lake. The hike up to the lake is steep, but well worth the effort. From downtown Skagway, go to 2nd Avenue and Spring Street and find parking in the large parking lot. The trailhead is towards the mountain side, over a bridge and across the railroad tracks. The trail starts climbing right away. After crossing the railroad tracks, the wide trail climbs up into the coastal forest. Right away you will come to a fork where you can continue straight or turn right. Turn right and duck under the large metal pipe. 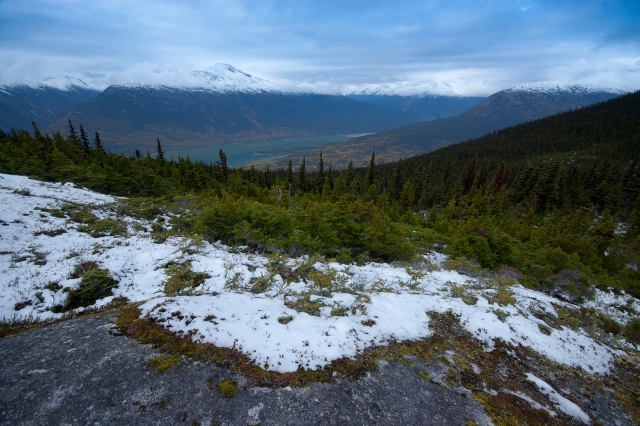 The trail is easy to follow and has a nice view over Skagway. There will be trail signs with directions to Lower (Dewey) Lake Loop and Icy Lake/Upper Reid Falls, but you want to follow the signs that point to Upper Lake/Devil's Punchbowl. 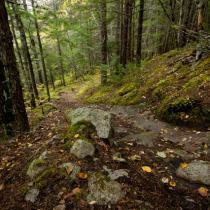 When you leave the signs for Lower Dewey Lake Loop behind, the trail will start to climb steeper. 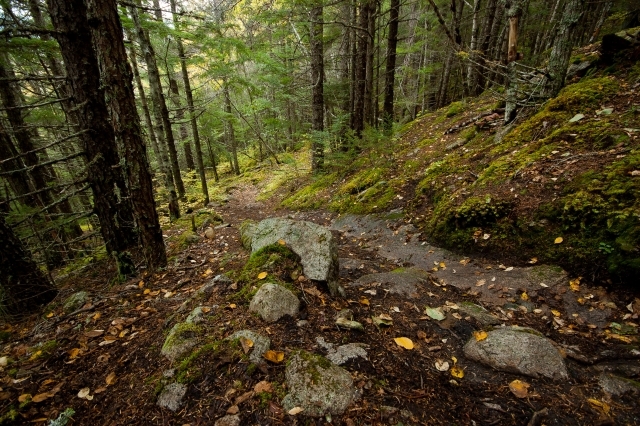 The trail is still easy to follow and well maintained. You will be in the forest the entire time (4 kms) until you get to Upper Dewey Lake. The trail is short enough to be a great day hike, but the view at the lake is pretty stunning, to make it a great overnight hike as well. 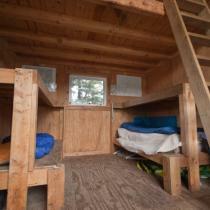 The free cabin is dark, but is still fairly large and has bunkbeds and a stove. The rental cabin has lots of light, a covered patio, and a view over the lake. The rental cabin has 2 sets of bunkbeds on the lower level (which could sleep 4 comfortably) and an open loft upstairs (where perhaps 4-6 people could sleep). A kerosene stove keeps the cabin toasty, but you have to carry your own fuel up. 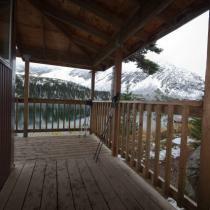 Contact the Skagway Recreation Centre to book the rental cabin. There are a few options for exploring the area. 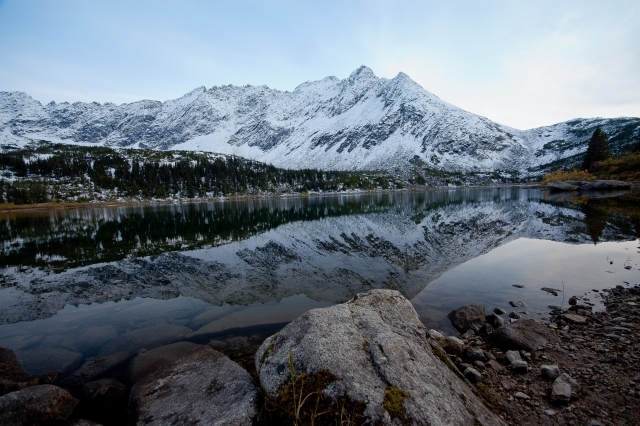 A popular option is Devil's Punchbowl, a small alpine lake nestled between the mountains to the south. The trail to Devil's Punchbowl is 1.8 km (one way) leading south from the cabins (to the right if you are looking at the lake). From the viewpoint over Devil's Punchbowl there is a steep, rocky slope which you could climb to get a better view of the area below. Another option from the cabin is to venture north (around the left of the lake) and climb a small ridge which eventually leads up to a much higher ridge. This is a longer side trip and can get technical if you try to get to the top of the ridge, as it is very steep and rocky. Even if you don't want to go to the top, you can get a closer view of the glacier on the side of the ridge and amazing views all around. 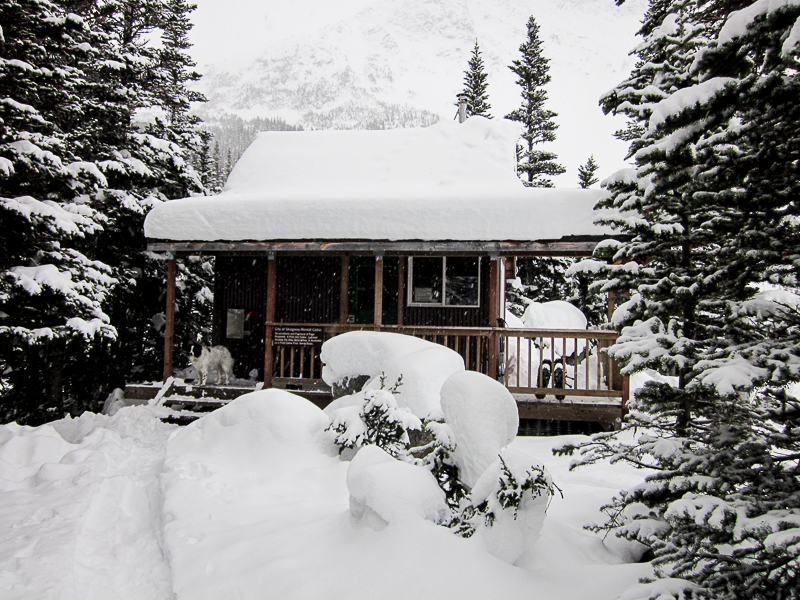 The hike up to the cabin in the winter is definitely recommended. Snowshoes will be needed. 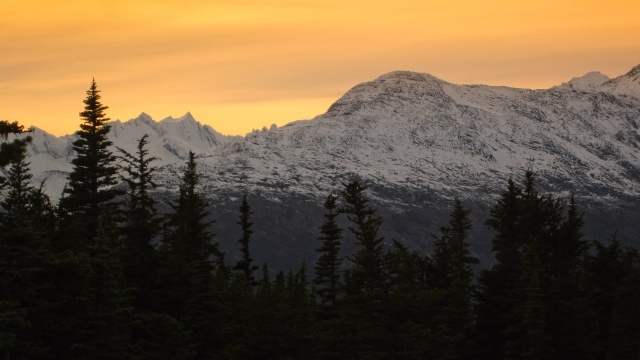 You should expect to add several extra hours to the trip, depending on recent snowfall amounts and whether any groups have been up before you to pack a trail. If you're trailbreaking you can expect the hike to the cabin to take up to 5 hours (bring headlamps for the reduced daylight hours). The way down will be a lot faster. 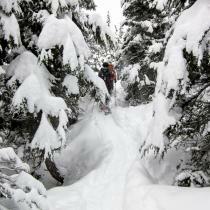 If you're planning on venturing out from the cabin you are essentially in avalanche terrain and should have the necessary gear and training. Several avalanche slide paths have even reached the lake. 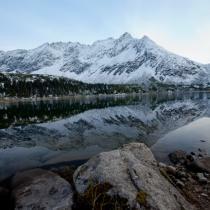 Have you been to Upper Dewey Lake lately? Yes you can easily make it to Devils punch bowl. Took about 2 hours with snowshoes in early January. Worth the hike up. 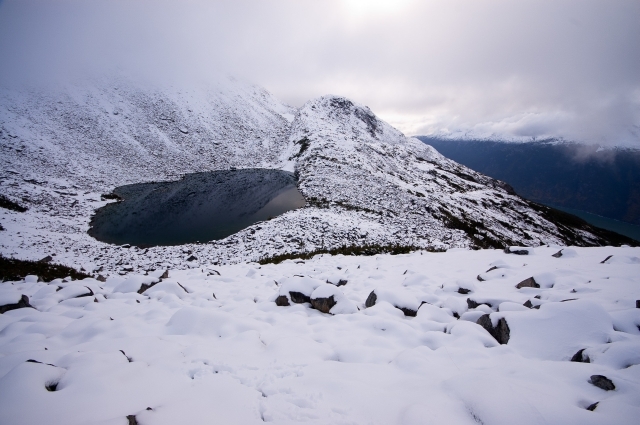 Can you make it to the Devil's Punchbowl in winter? Did this hike June 12 2018.
be sure to do the extra 1.8k to Devil's Punchbowl after you get to Upper Dewey Lake. You get a much better look at Dewey Lake this way. Devil's Punchbowl was still frozen, you can throw some snowballs in it though. Very much worth the trek, very steep hike though. Waterfall next to you as you climb the trail the entire time. Took about 5.5 hours roundtrip. Access to several other smaller hikes too if you have the time. Completed this hike on 23rd December. Really great trail conditions, practically no snow until you reach the alpine area. There were a couple of icy sections of the path, but you could walk off the side in the woods. Took 2.5 hours up. Snowshoes required in the alpine. We made the hike to Upper Dewey Lake as a day trip on Sunday February 19th. 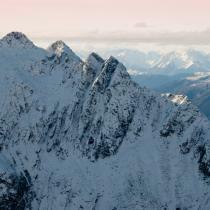 Although the climb up took us 3 hours, you may find it much faster with crampons and snowshoes. There is a fair amount of ice on the lower portion of the trail. Once you reach the higher footbridge, the snowpack is consistent enough to provide a better footing. Snow shoes might be helpful if you'd like to explore the ridge to the Devil's Punchbowl, as there is presently no path and a good meter of snow! We were lucky to have warm temperatures and low winds. 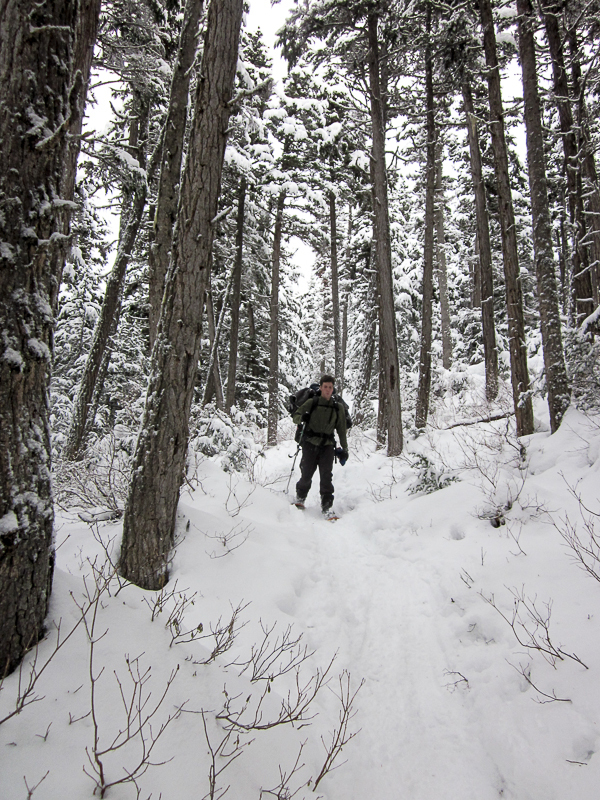 Without crampons, we were able to skirt off the path on the decent to avoid slippery sections. 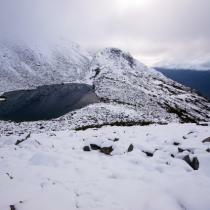 It was a real joy to see the upper lake in winter, and completely feasible as a day trip. Hiked to Upper Dewey & Devil's punchbowl on Sat Oct 1st in the p.m. It is a steady and uneventful uphill for the first 4 kms to the lake so make sure you keep time for a side trip. We continued to Devil's punchbowl and got rewarded with great views. 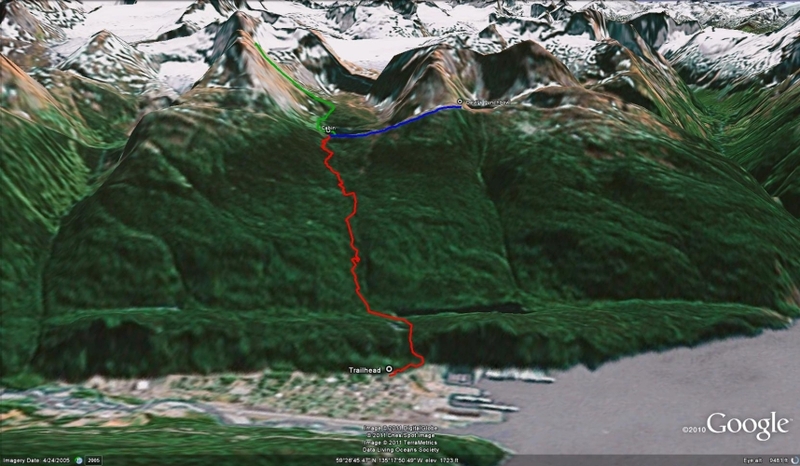 It would only take about an hour return to scramble the small peak NE from the lake. Nice hike. BTW... 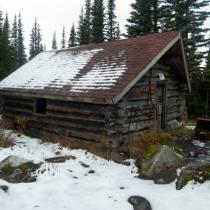 The old cabin only needs a half hour of sweeping to make it a decent place,. There's a wood stove but considering the scant vegetation around, I would bring 1 or 2 long burning logs from Canadian Tire and call it home for a night. The new cabin is definitely nicer but I think the old cabin is kinda cool. Nice day, nice scenery! Did the box of rocks hike on September 30th but walked, not ran! Was a very foggy day, low visibility until we got to the cabins. Took us about 2.5 hours to get up. Such a beautiful hike. Steep,but several areas where the trail levelled out. There's a waterfall you can hear and often see, the trail leads right up to it. 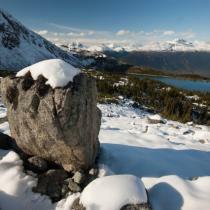 Great place to fill up our water bottles and have a drink of the freshest cleanest water. Lots of blueberries to munch on going up. Got up to the cabin and the fog cleared to reveal we were at the foot of massive mountains. There were about 20 other people up there, we shared a few well earned beverages and revelled in the beauty of the place, warmed up in the cabin and caught a helicopter down. 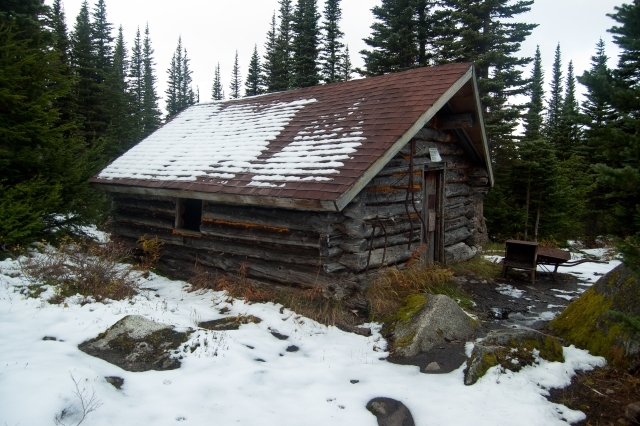 Will definitely be back to spend a night in the cabin and hike the devils punch bow! Spent 2 nights up there this December w. a group of 6 + 1 dog. Trail was icy till lower dewey (we wore cleats) and then snow covered for a bit till we put on our snowshoes and broke trail through 2 ft snow for a couple of hours. 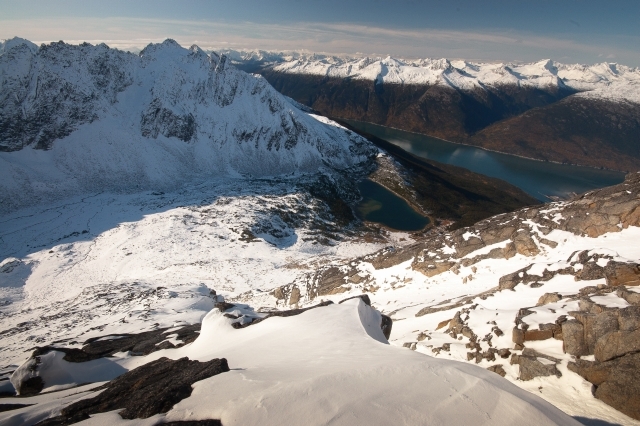 It's a steep, hard hike in the winter. Took us 5 hours up, 2.5 hrs down (broke through 1 ft). Trail isn't that well marked in the last <1 km, we followed some faint tracks in. Burnt 9 L of Kerosene (bought @ CND Tire) in the stove over the two nights. Cabin took 5 hrs to warm up on max. Loft gets HOT! We could have used a a few more litres, as we rationed during the day. Glad we read the comments here, rather than use what the rental agreement says (1 gallon/24 h). Easy access to creek for water. hiked up to Devil's during our down day. Tried ice fishing. Had a great time. Will return! 3 of us hiked Upper Dewey Trail on May 30/31. 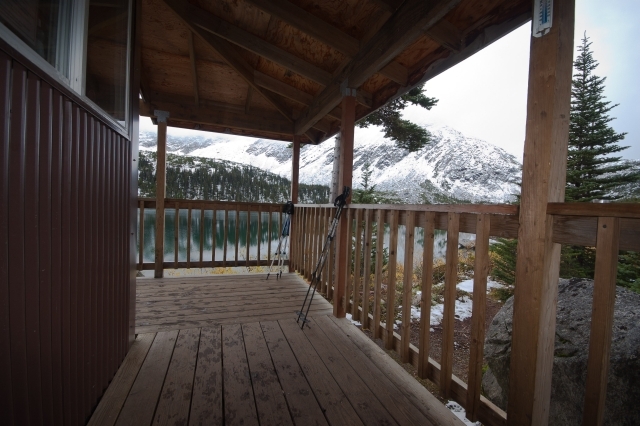 We booked the cabin (sweet cabin - great views of the lake and mountains). Trail is well marked and easy to follow - snow free. Hiked to the Devil's Punchbowl during the afternoon. Not an obvious path due to some snow but for the most part the snow was packed - easy to figure out where to go - a nice side hike with great views. 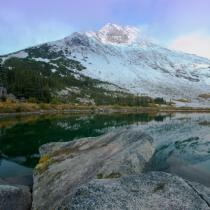 The next morning we hiked up the north end of the lake towards the glacier. A few snow crossings (snow was relatively packed) and quite steep as we got higher. No obvious trail. Endless opportunities for how far/where you want to go. 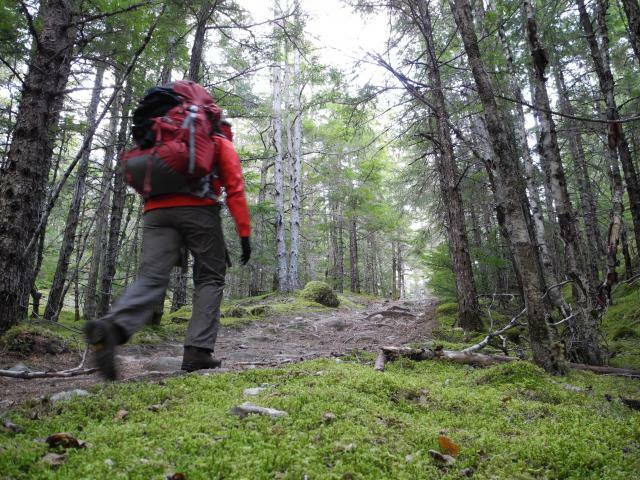 Overall a great overnight hike with 2 great side hikes. 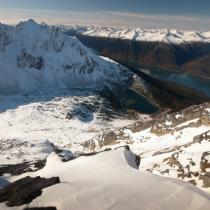 Upper Dewey to view of Glacier - approx 1.5 hours each way (more if you want to hike to the true summit). Bring a camp stove and all cooking gear. We didn't need to heat the cabin overnight. There was a fire ban while we were there but there is a small fire pit and grill up there. Not a lot of wood around. This was our second time hiking Upper Dewey Lake hike but our first in winter and it was adventurous! 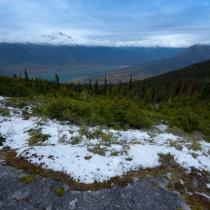 The trail started out cleared off but soon turned to packed snow which had now become ice with the rains. 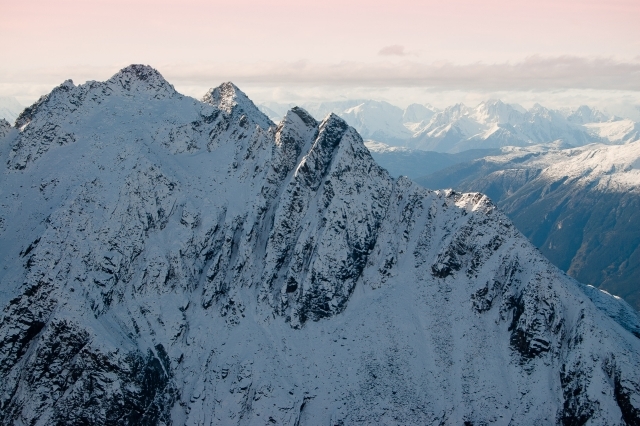 Micro spikes or some kind of crampon are a must especially descending through that area! Snowshoes would have been nice for the very top, the trail is not easily found and we had to trudge through some pretty deep snow to get to the cabin! We had two gallons of gas and it more than lasted us for the two nights up there! Eight people and two dogs went up on December 31. It took us 3.5 hours to get to the cabin, 1.5 to get back down. We brought 11 L of fuel for two nights, it looked like there were at least 2-3 L left in the tank when we left. Lots of wind up there, glad to have four solid walls and a warm stove! 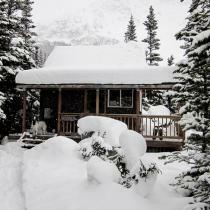 We snowshoed up to the rental cabin last weekend (November 10th). There was only a few inches of snow in Skagway at the trailhead, but half-way up we ran into a few feet of snow and had to break trail. It took 4.5 hours to get to the cabin. It took less than 2 hours to snowshoe back down. We used about 6 litres of Kerosene for 2 nights in the cabin. We took a day trip to Devil's Punchbowl and had to break trail again through a few feet of fluffy powder. 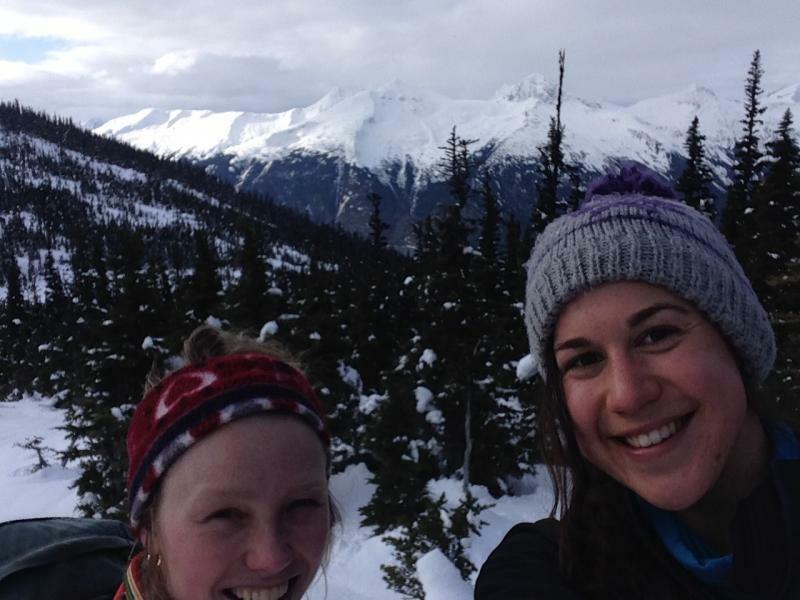 Fantastic trail and epic views! 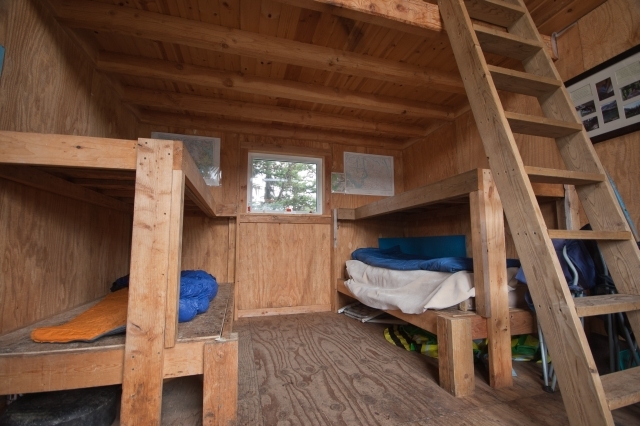 Spend the extra dough though and rent the new cabin, the free one is brutal on your lungs. I really enjoy this hike. It's great anytime of the year but the Fall is the best time! 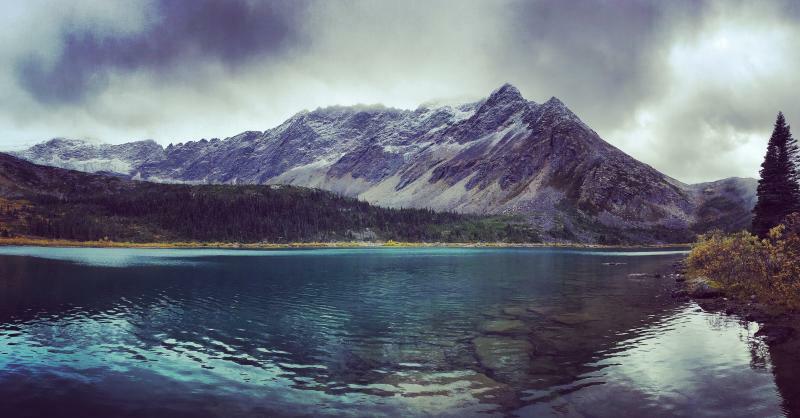 The snow covered peaks around the lake are breath-taking with the fall colours. 907-983-2544 : these guys can give you lots of information on conditions and have an excellent shop with good gear/ prices. 20% off sale until around December 24th. Lots of fresh snow both in town and on the trail. 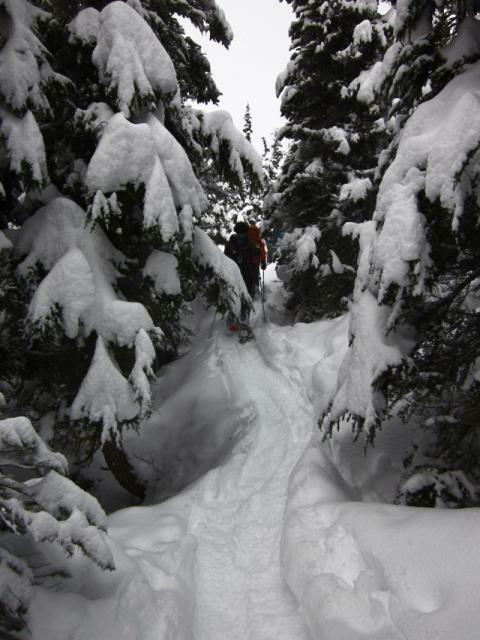 (maybe an understatement) Trail started out with 1.5-2 feet of fresh snow the the Upper Dewey/ Icy Lake cutoff. Approximately 700 (m) walking distance up from the Icy lake cutoff snow depth increases above 2 feet to 5 feet in places to consistently 4-5 feet +. The trail was NOT broken at this time. 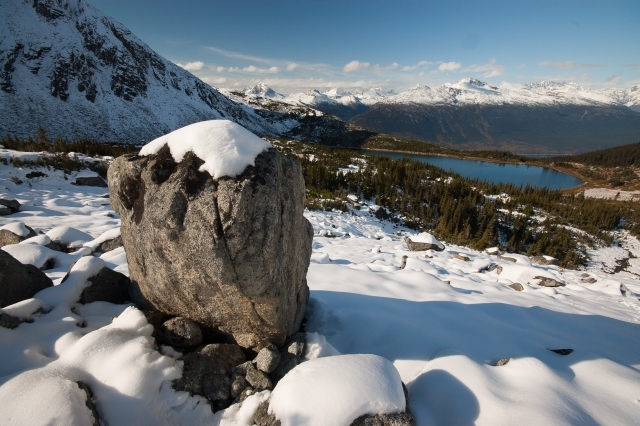 At 550- 680 meters above sea level, snow depth increases to 6 feet. At this point, there is a clearing and hidden tree wells are frequent. The trail markings also dissapear and we could not find the trail. 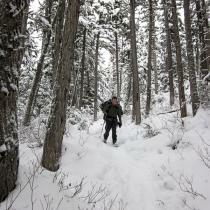 We recommend at least 10 hours to accomplish the trail to the cabin (until the snowpack consolidates). 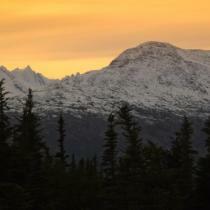 By November 29th snow was melting in the lower elevations and the freezing level was forecast to rise dramatically.